A special program in Washington DC is connecting seniors who are at risk of isolation and depression. Participants in the program are socializing with others who they’ve never met, taking classes together, and finding others with similar interests. But the program isn’t your typical book reading club or bingo night-out activity. No, the program is focused on keeping seniors connected by using technology—specifically, the internet. Today’s tech savvy generation has pretty much figured out how to connect with others all over the world. Social media platforms like Facebook, Twitter, and Instagram teem with multifaceted networks of friendships, acquaintances, and communities that allow for even international connections to happen. And although a growing number of people are connecting to the internet every day, there are still others who do not have the means to do so. However, the special program in DC called Connecting to Community, has partnered with organizations to provide seniors with discounted internet service, computer training classes, and iPads. 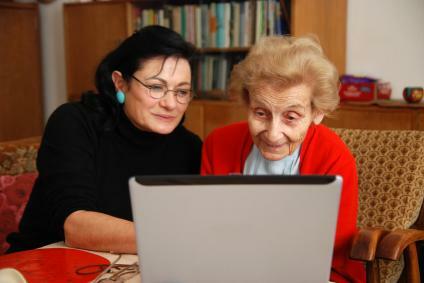 The program has taught seniors how to use the internet and Skype to connect with friends and family and has introduced the participants to a world where connections with others can easily be established. Ultimately, the goal of the program is to curb elders’ risks of depression and isolation by use of the internet and technology. In essence, the iPads and the internet have served as an alternative, technological way of caring for our seniors in ways that were impossible just 2 decades ago. But the idea of using technology to foster care for our seniors is not new; it is a growing phenomenon in the healthcare industry and has also found its fit in home care. One of the ways in which the home care industry has used technology to care for seniors is by using a reliable home care software or home care system. Many home care software systems are focused on scheduling, processing invoices, and managing caregivers. However, there are other home care systems in the market that do much more. For example, ClearCare’s home care system includes an advanced program that allows caregivers to simultaneously leave comments for other caregivers, family members, and office staff about a senior’s health condition. Just as the internet has allowed seniors to connect with others through the Connecting to Community program, this ClearCare home care software feature allows everyone involved in the care of a senior to stay connected and to flag anything that might seem out of the ordinary. Additionally a home care system or home care software helps ensure that there is always someone assisting a senior at their place of residence. Not only can administrators use a home care system to look for available caregivers, but they can also use it to ensure that caregivers are arriving on-time to be there at the point of care. And with internet being more accessible, a web-based home care system like ClearCare allows healthcare administrators to track a senior’s care on-the-go, ensuring that a senior’s needs are immediately addressed. Advancements in technology have offered many benefits to the general population with a social media platform and a faster way to communicate with others. As the healthcare industry finds ways to better utilize technology, a growing number of our seniors will too benefit from the resources that are already helping thousands receive better care.